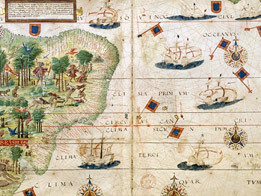 Following the Great Discoveries at the end of the 15th century – in particular the discovery of America and the opening up of sea routes between Europe and the East Indies – Portugal and Spain established trading networks which contributed to the creation of the first global economy. The first colonial empires made a deep impact on the peoples living in these regions, particularly in America and Africa. At the beginning of the 16th century, thanks to their superior navigational skills, Portugal was able to create the largest commercial and maritime empire the world had ever seen. It extended from South America to the Far East, and along the coastlines of Africa and India. Thanks to their skills in long-distance navigation and their network of trading posts, the Portuguese took over trading routes linking the Persian Gulf, the African coast and the Western coast of India which were previously controlled by Arab intermediaries. From their base in Malacca, they became involved in trade with the Far East. Following Christopher Columbus’ discovery of the Caribbean islands, the Treaty of Tordesillas confirmed Spain’s dominion over territories in the New World, which at the time Europeans called the Indies. Spain’s conquest of the Americas was rapid and brutal. It also led to the introduction of new diseases that decimated the indigenous peoples. Chosen by the Governor of Cuba to explore the coast of the American continent, Hernan Cortés landed in the region now known as Mexico with only a few hundred men on 22 April 1519. There, he met and made alliances with the Totonac Indians who told him about their hostility towards the Aztecs and the riches to be found in the city of Tenochtitlan. At the beginning of the 16th century, the Inca Empire covered the Andes from the Equator to northern Chile, a territory of nearly 4,000 kilometers in length. By the time the Spanish arrived, a power struggle had lead to a civil war that weakened the Inca empire. The Spanish king’s authority in the Empire was delegated to two separate bodies: The Council of the Indies and the Casa de la Contratacion (or the House of Trade). The Empire’s territories on the American continent were divided into two vice-royalties: New Spain and Peru. In the early years of the 16th century, the kingdom of Spain had a monopoly on trans-Atlantic trade with its colonies. Seville stands on the River Guadalquivir, 90 kilometers inland from the coast, and was the only port authorized to trade with America. One of the key factors in the conquest of the New World was the search for gold and precious metals. On their arrival in the Antilles, and later on the American continent, the Spanish Conquistadors took all the gold amassed by the Indians, mostly in the form of jewels and religious objects. Merchant ships sailing between Seville and the Americas were in danger of attacks from pirates, and it was therefore decided to make them travel in convoys. Beginning in the mid-16th century, two convoys were organized each year: one to Veracruz in New Spain, and the other to Cartagena and Nombre de Dios. The longest and most ambitious trading route opened up by the Spanish in the 16th century was the passage across the Pacific, between the Philippines and America. This sea route led to the development of new commercial opportunities linking China, America and Europe across the Pacific and Atlantic Oceans.